Each crop is worth a default value of 1 point, so if you match a line of 3 you will get 3 points.. Simple so far. As you get to higher levels just matching 3's is not going to give you enough points to pass, so how do you increase the points value? The simplest way is just to make matches BESIDE the crops you need. 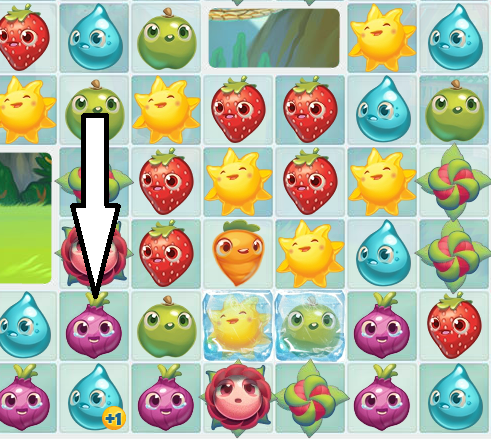 In the example below we need water drops, so I can match the onions which will give the water drops an extra point each. 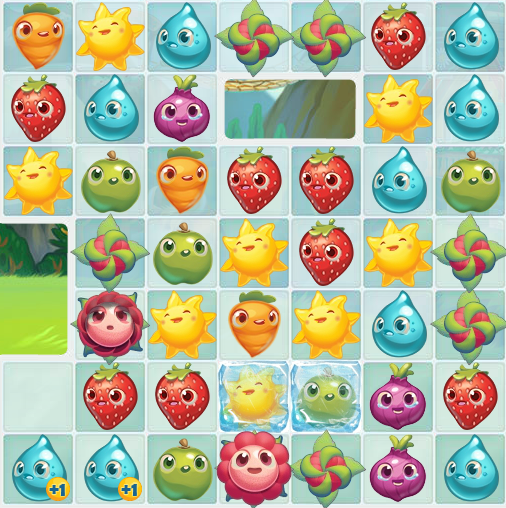 The only thing you must remember is that once the crops have the extra points they must be matched the next move or they will lose the points. 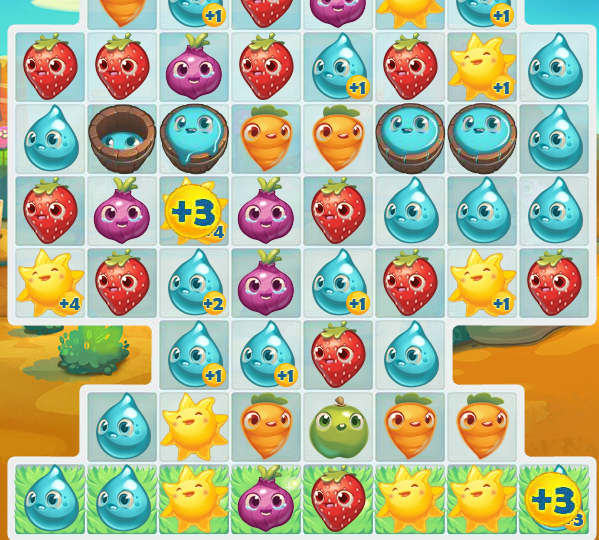 The pictures above were just to show how it works and I wouldn't normally waste that particular move because I can't match the water so the points will be wasted. 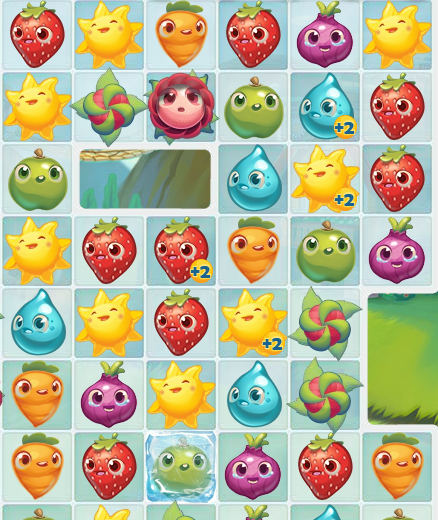 Cascades will also increase the points, so if you try to work at the bottom of the board causing other matches further up, each match beside a needed crop will further increase the points value by one, up to a maximum value of 9. But again, you must make the match on the next move or the value will go back to one. A good way of increasing the points value is to look for a line of 4 match. See below. 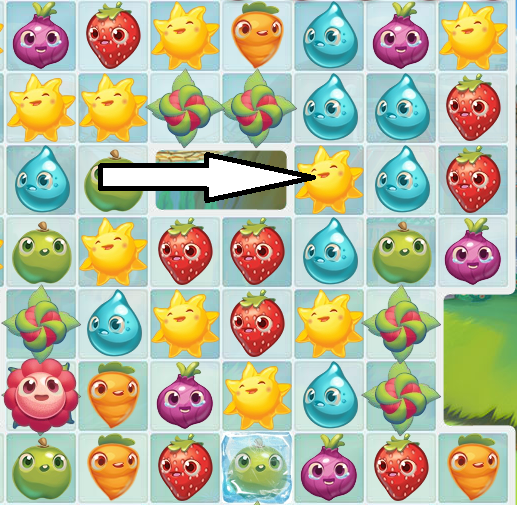 Move the water left to make a line of 4 and all needed crops touching the line will be increased by TWO points each. 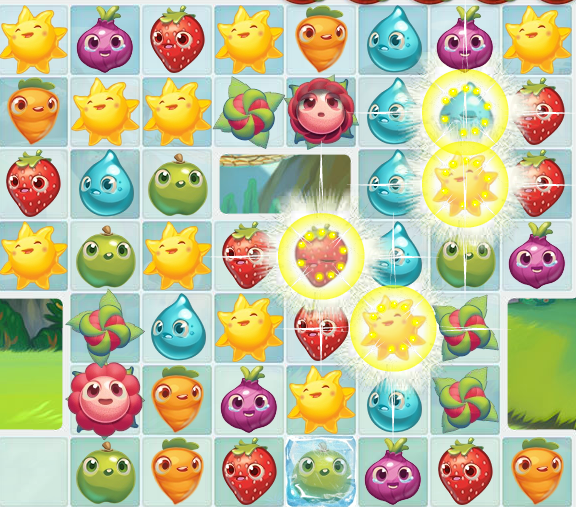 Then you need to make the best match to get the highest number of points on the next move. 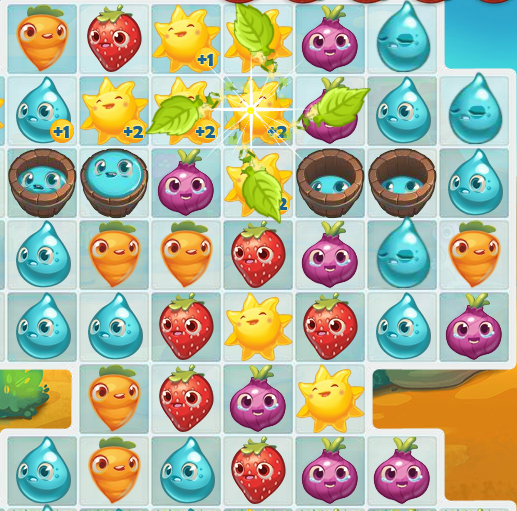 So you can see from the above examples that you need to be always looking at least one move ahead to see where you can increase the points and also take the crops with most points bvefore you lose them. Another way to increase the points is to look for L and T shapes. Below is a T shape in suns.. This will increase the points on all the needed crops in lines across and down by 3 points. The L shape, below in water drops, will do the same, in lines along the horizontal and vertical. In the image above you can see that the squares along the bottom of the board are green. These are grass squares..
All crops sitting in the grass has a default value +2, so is worth 3 points when collected, plus any other points added for matches beside them. So it's always a good idea to try to get your cropsies in the grass if you can before collecting. This is just a basic guide and I hope it is helpful.. Please share with your friends if it may help them.